In this video, shot at the Winter Fancy Food Show 2019 in San Francisco earlier this month, Farmhouse Culture CEO Scott Lerner shared the company’s 2019 growth strategies with NOSH editor Carol Ortenberg. Lucini Italia, the leading producer of premium Italian extra virgin olive oils and creator of authentic, handcrafted Italian-inspired gourmet foods, is proud to unveil a refined branding, in addition to three new on-trend products in the sauce and vinaigrette categories. EPIC Provisions, category leader of sustainably sourced meat-based products, will showcase a brand new line of premium Jerky Snack Strips at the 2017 Winter Fancy Food Show at booth #361 from January 22-24 in San Francisco. Roasted cacao nibs, spicy habanero, sweet honey, tart raspberry and boozy caramel are some of the irresistible flavors in Lake Champlain Chocolates’ newest additions to their organic chocolate bar line. Torie & Howard is rolling out its new trial size bag of organic Chewie Fruities® candy for retail at the 2017 Winter Fancy Food Show with a countertop and shelf display carton, Booth 762. 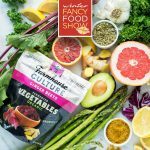 The hottest new specialty food products, producers, and trends can be found at the 2017 Winter Fancy Food Show. The Specialty Food Association announces the six winners of the 2017 Leadership Awards, honoring industry frontrunners who have gone above and beyond in advancing food standards in society–and society itself–by creating social, economic and environmental impact through innovation and vision.